Do you know what is WordPress? Why is it so popular on the internet? This article reveals the secrets of Wordpress success for over a decade of web development era. WordPress has gained a paramount importance in the world of the website development within 11 years of inception. At present, around 74 million websites are running on WordPress and this number is growing faster. Even if it is famous in the digital space, still most of us do not have any idea about WordPress. Some people have a misconception regarding this technology. Though WordPress is a CMS it is also popular as an e-commerce platform and often mentioned in ecommerce books as a viable option for website owners and online businesses. Below are some facts about WordPress that makes it the best choice. WordPress is basically an open-source content management system (CMS) that provides an integrated framework to develop and manage the content on the website. This CMS has been developed in PHP. Its back end system features MySQL. It was launched as a self-hosted blogging platform, which empowers the users to integrate different themes, components like testimonial section, comment section, navigation menu and others. As the time changes, this CMS has become useful for developing the websites other than blogging sites. In order to use WordPress, there are 2 options. First is to download & install WordPress and second is to log in to WordPress.com. Within a few seconds, your account is ready to be used as Blogging website for free. In order to go for the first option, you must have Web Hosting Plan. Wordpress is the most popular CMS based on Google search trends. This is mainly due to its amazing general purpose website features. Below snapshot from Google trends should give you an idea of WordPress popularity in recent years. 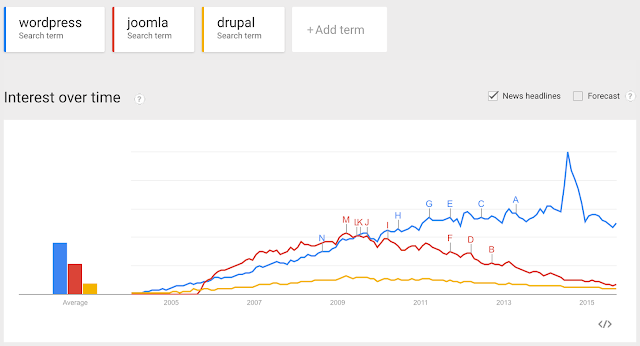 Wordpress is most often used CMS for all options. Below graphic can show you the types of features that are more used with WordPress. WordPress comes with a feature-rich dashboard. This dashboard enables you to set different components of the websites in a simple manner. This also saves the time and efforts of the users while modifying the website content. In order to change the theme and other settings, the dashboard features the powerful tools that simplify the way to configure the themes. Super Admin: This person has complete access to all the administrative features. Subscriber: This person manages the profile. WordPress supports around 70 languages. Therefore, other than English, you have the option to create the website with content on native language so that the native users can easily understand the content. This will boost the user’s engagement and ensure a better experience. All the WordPress themes are easy-to-be-customized that means the website owner can easily change the theme according to their desirable structure. This will help the website owners to give the unique look to their website. This CMS comes with brilliantly designed publishing tools. This empowers the users to upload, modify and create the content without putting a lot of efforts. It’s like a layman’s job for the website administrator to handle the content. It streamlines the way to add different media features like image, video, and audio so that the website owner can have the capability to make the website content more engaging and understandable to the users. As the WordPress is an open source content management platform, hence no fee will be charged for running the website. Additionally, the owners of the website have the full rights to change and improve the code as per the requirements. One more thing is that there is no hidden cost in terms of running the blogging website and the other online business website. WordPress is highly flexible. It is not only limited to blogging space but also enabled for any kind of business websites such as e-commerce, news portals, and others. There are different extensions and plugins available that streamline the way to add the desirable features with the website in order to implement the elements of a business. As compared to other platforms, WordPress can be easily installed as well as configured. It is packed with different wizards that ease the way for the users to install different features of the website in one go. Even they do not have to configure a long list of components including comments section, RSS feeds, and others. Indeed, it is a kind of ready-to-go platform because when the installation is complete, it is ready to use. The architecture of this CMS is search engine friendly. Hence, the search engine crawler can easily list the web pages in the index. These features offer a competitive advantage to the businesses. It makes it easy for the businesses to gain the better search results. Earlier WordPress was not secure enough against Cyber attacks or unethical breaching. But, as the time changes its architecture has become more secure. It is recommended that the website owner should consider deploying the imperative measures to make their WordPress websites secure. It is always better for the website to not install any third party plugin provided by untrusted sources. The most important thing is to ensure that the WordPress framework is updated. This will make the website more secure and safe. Owing to growing mobile space at a faster pace, it has become necessary for all the website owners to make their website compatible and responsive to different mobile operating systems and screens respectively. With WordPress, it is easy to achieve because this platform supports multiple themes that are responsive and those responsive themes can work on different smartphones and tablets. This feature enables the users to maintain the single URL for the websites that can be accessed through the desktop and mobile devices. WordPress is compatible with all the hosting servers. Hence, the website administrator is free to choose any hosting service that can handle the web traffic and provide a required service. Multiple wordpress plugins are available to streamline the way for the users to customize the functionality of the website. You can add testimonial section, social media, Google analytics and many other features with your website. 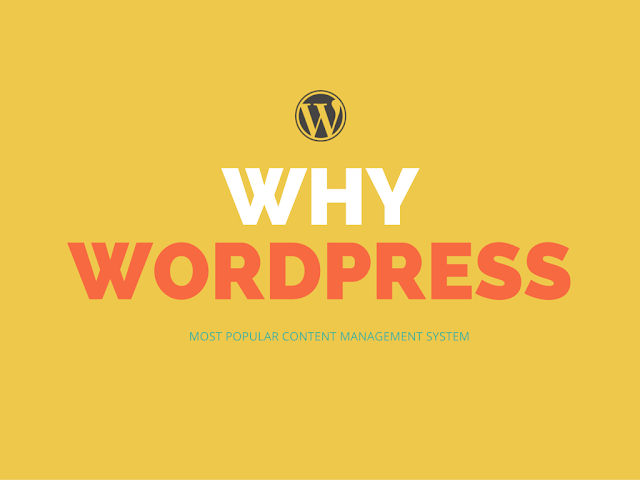 Here are other reasons why this PHP based content management system is so popular. Wordpress is extremely easy to learn. Anyone can start using it without prior knowledge of a programming language. Though knowing programming in PHP may help you do advanced stuff, it is absolutely not required for most WordPress users to learn about it. Wordpress is the most popular CMS, therefore, finding a quick help on the internet is not difficult. Many blogs exclusively share WordPress tips and tutorials. You can also visit discussion forums and message board websites to ask a question. However most of the time you will find an answer by simply doing a search on the internet. Wordpress has the largest community of freelance developers. These developers are fast at development and problem-solving. You can find good help at a really low price. Almost all popular freelance websites have WordPress freelancers that are ready to work for you immediately. WordPress is a powerful and cost-effective framework that is packed with an advanced capability to streamline the process of the website development for different kinds of businesses. With the changing times, the WordPress is improving and will prove to be the best platform for developing the complex websites for everyone. The blog has been penned by Bryan Lazaris, (@bryanlazaris) a web developer working with HireWebDeveloper. Blog writing is one of his hobbies and he makes it a point to share his knowledge and insight on the latest technological innovations, on-going trends, programming skills and much more. His experience and expertise are evident in his writing which has inspired many budding developers.